“Have you ever wondered who was viewing your Profile? 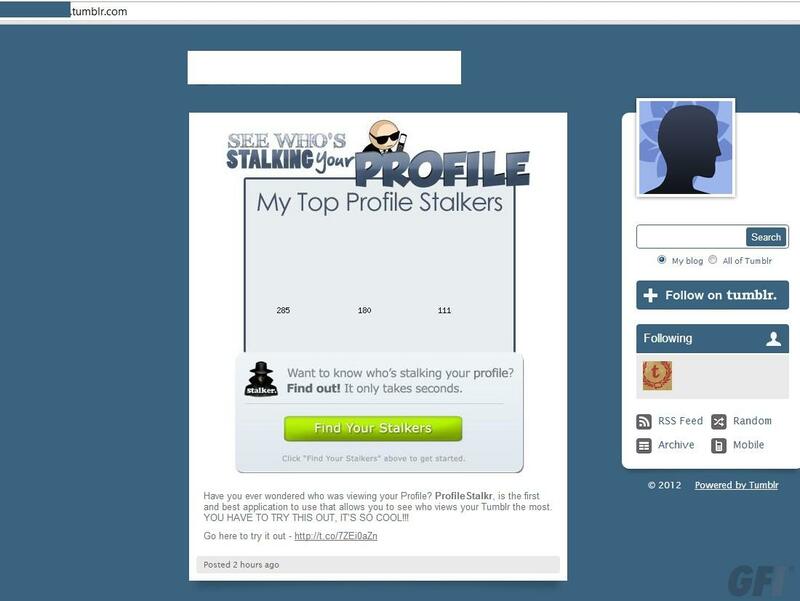 ProfileStalkr is the first and best application to use that allows you to see who views your Tumblr the most. YOU HAVE TO TRY THIS OUT, IT’S SO COOL!!! Once the app viralizes itself, it’s inevitable that it will pick up more innocent Tumblr users along the way. It’s apps like these that make us wary of ever adding ones that require your permission for “read and write” access to function. Once you add the app, you won’t even get your “profile stalkers” with ease. Instead, when the app claims to have found your stalkers, it will ask users to complete a 30 second survey before accessing the probably false information about your so-called stalkers. 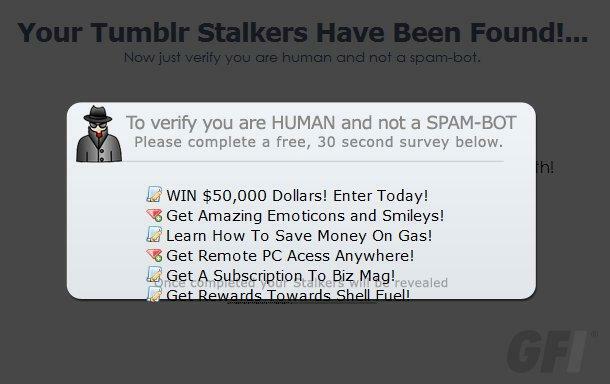 Similar scams have been plaguing Facebook and Twitter for years, and you would think people would know better by now. So just remember this: If an app sounds too good to be true, it probably is. If you’ve been a victim of the spam, it will take a little more than just changing your password and deleting old posts. Remember also to go into your app settings and revoke the “read and write” access from the app. A good rule of thumb is if you can’t install an app without that permission, it’s best to just not add it at all. And one more time, for good measure — if an app says it’s going to show you who’s viewing your profile, it’s almost certainly spam.